Firstly I have been so so busy (writing and editing a book and testing some new recipes for a food magazine) that I forgot to post on the 14th of month so sorry for being a couple days late and it has to be a short posting since I'm attending a wedding interstate very shortly. What an intriguing and stimulating challenge John (of eat4fun) has given us this month – home preserving!!! I love his blog he always has great step-by-step photos and he has a great depth of knowledge on technical issues. See here for the challenge. 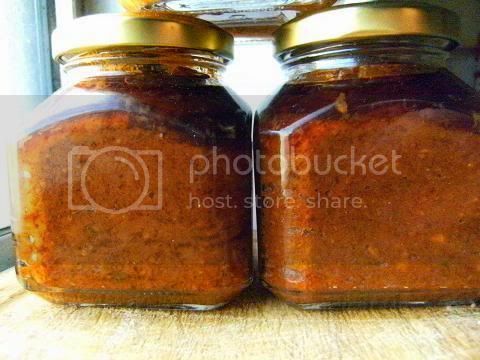 I decided to do semi-dried tomato 'pesto' as my first canning project, I was surprised how easy it was and the enormous sense of achievement you get from home canning. I used new lids on old jars that I have been storing for a long time. I winged the recipe a little I basically followed the bruschetta-in-a-jar challenge recipe and added some olive oil, (Parmigiano-Reggiano) parmesan cheese and pine-nuts. I used my stock pot as the cooker and my steamer insert as the trivet for the canning process. 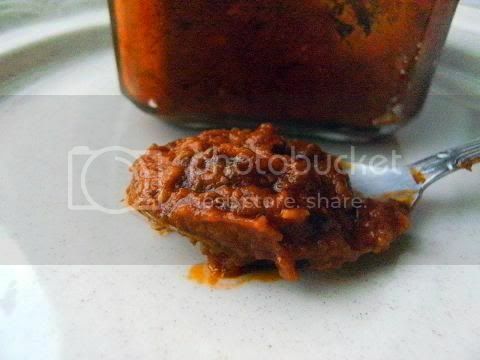 I used a hand blender to make a smooth paste of the cooked ingredients. I just loved this challenge I think I will be doing a lot of canning this month. 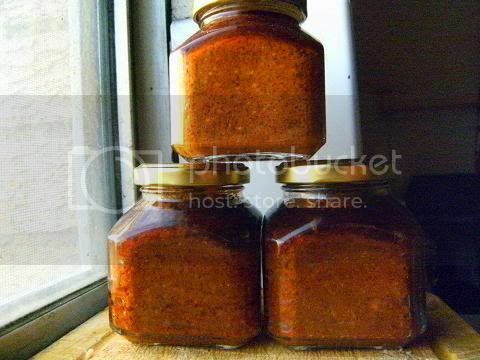 Total cost – $5 for 12 jars! The major cost was the lids $2/dozen. I should mention since these 'pesto' jars contain oil and I tweaked a (boiling pot recipe) I immediately froze them, since oil can make the seals fail. Remember only use reliable recipes that have been tested and if in doubt use the high pressure canning process that can produce high temperatures of 245F (120C) that will kill nasty germs or freeze the product and re-boil for 10mins before use. Well when I posted this pesto on the forums I promptly got a couple of emails that pesto needs to be pressured canned so I took the pesto out of the bottles and froze it instead. 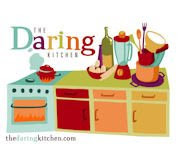 As stated by the host only try recipes that are tested and well researched. 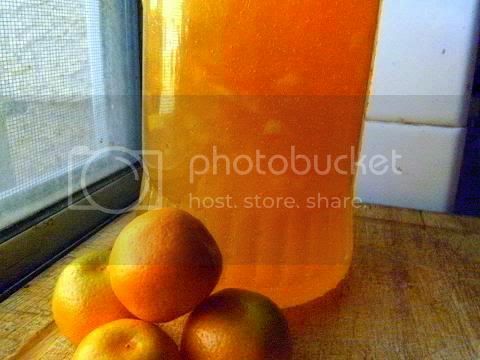 I did another batch using a reliable recipe from this site for kumquat marmalade, I used one piece lids (and old jars) since the two piece lids are very hard to found here in Australia. I followed the instructions scrupulously, but I used jam-setting sugar (that has added pectin in it already) that is available in Australian supermarkets (Coles and Woollies). Overall the process was easy. I only made a litre of marmalade, 4x250ml jars. I searched my storage cupboard I found 243 old jars (with the old lids) that I have been collecting for my Mum's friend LOL LOL LOL I have enough jars I think.